Drain the soaked split green peas, place in a pot with water and bring to boil, cook for 20 mins. Meanwhile, also cook the 2tbs of red quinoa and 2tbs of black lentil and drain. While the lentils are cooking, heat up oil in a non-stick pot and fry your bacon until crispy, remove and drain on paper towel. In the same pot, make sure the oil is very hot, then sear the scallops for one to 2 mins on each side. In the same pot add olive oil and fry garlic, onion, celery and anchovies for 1-2 minutes. Add split green peas, spinach and frozen green peas. Sauté for a further 3-4 minutes before adding vegetable stock. Bring to the boil and simmer for another 5 mins. Allow the soup to cool slightly before blending it fine with a hand blender. Wile the soup is cooling, make your Parmesan crisps. Mix the grated parmesan with half the amount of cooked quinoa and lentils, reserving the rest for garnish. Heat up a non-stick frying pan and spoon little circles of the mixture. Cook until the mixture starts to bubble and you start to smell the cheese baking, turn of heat and cool until it crisps up, then gently lift up. Repeat these steps for more crisps. To plate, place 3 cooked scallops around the sides of each bowl. Gently pour the soup in the middle of the bowl so it slowly spreads out evenly. 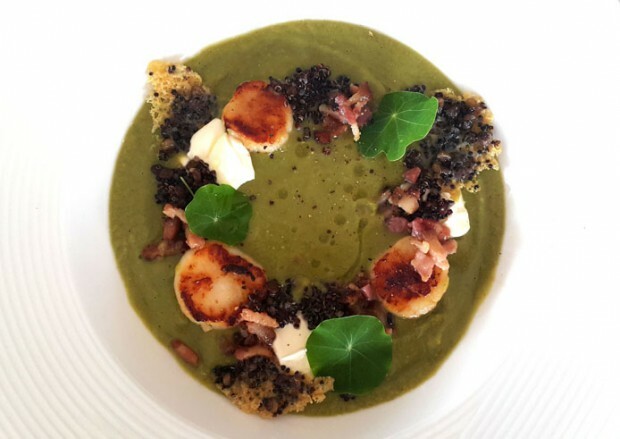 Add a teaspoon of creme fraiche next to each scallop, then sprinkle bacon and remaining black lentils & quinoa around. Garnish with nasturtium leaves, Quinoa & Black Lentil Parmesan Crisps, black pepper and a drizzle of olive oil. Instead of using salt, I’ve used anchovies to flavour the broth.